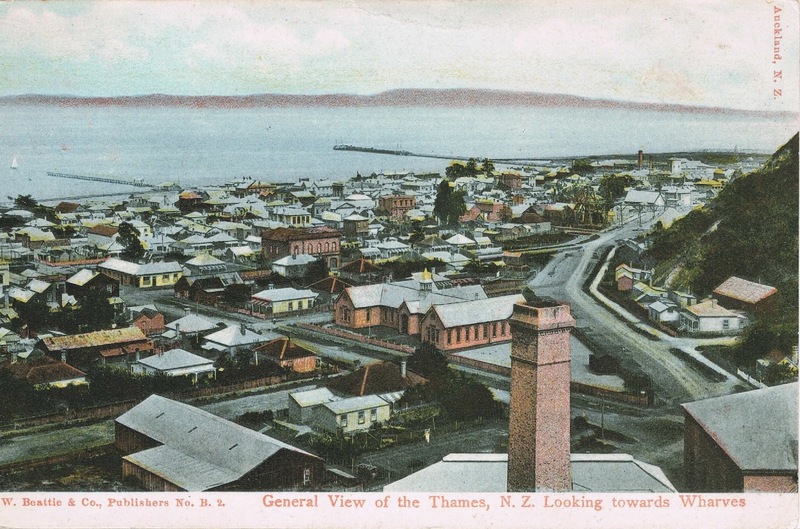 Many of the c1900 postcards of Thames can be seen in black and white, and the same scene coloured. The richness of the colours remains today in these beautiful old cards. You can use the cards to identify changes in the town, and for making estimates of when the photo was taken. This card was posted 1907, but the photo for the card may have been several years before that. 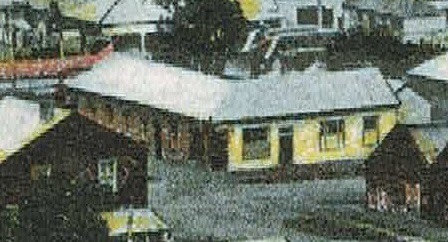 The Cornwall Arms Hotel, on the corner of Pollen and Cochrane Street is enlarged in the bottom photo. Renovations and tenders were called for on 29 September 1906 by Mr Currie architect of Auckland. Repairs to the hotel were undertaken and a second-story added. What else can you spot in the way of landmarks? The Curtis wharf at end of Albert Street on the left and Burke Street/Thames Wharf at the end of Burke Street centre right. 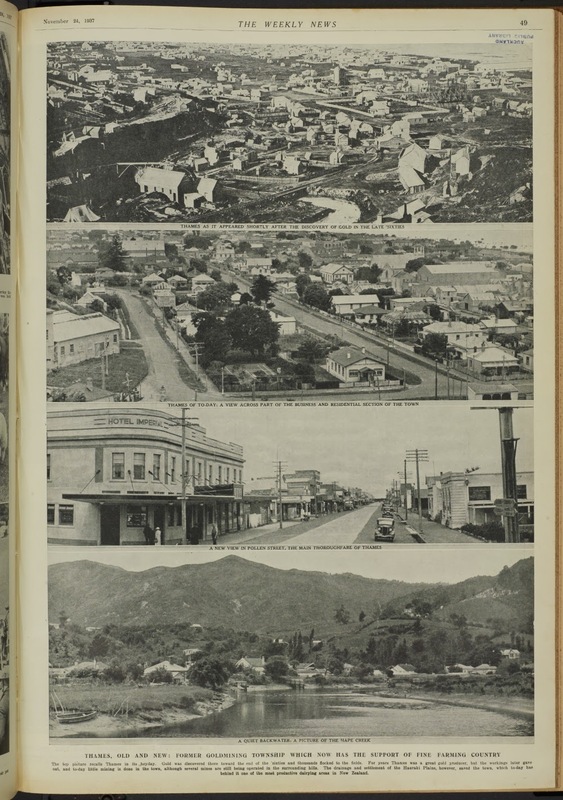 Waiokaraka/Central School in the middle and the Saxon Mine Shaft further right. Pumphouse and chimney in the foreground. 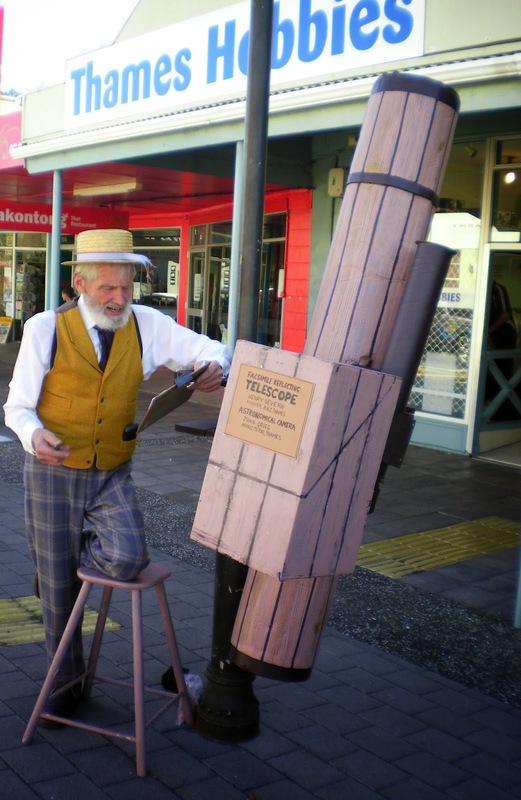 Thames, The Living Museum is a concept that incorporates interactive demonstrations of crafts, as well as a chance to meet on the street people who inhabited Grahamstown at the turn of the century. Each week day between 10.00am and 2.00pm you will be transported back to the days when the lure of gold was potent and the town was alive with intrigue. Visit a working metalsmith shaping a piece of fine jewellery at Debrasic, a milliner displaying hats and clothing from early 1900's (at Embellish), watch the making of a traditional Maori feather cloak (at Embellish), see spinners and knitters in action. There will also be street entertainers and the chance to heckle the street corner orators. With one day to go, if you can make a visit between 10am and 2pm today (Thursday) and Friday 21/3/2014, you will not be disappointed. 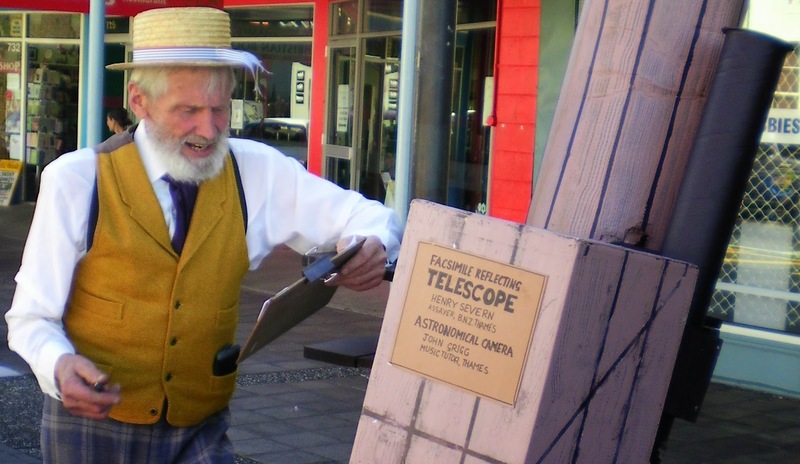 Mr Severn was busy assembling his telescope when I visited. The Captain of the ps Wakatere was due in from Auckland at any moment. I noted that Miss Lush had signed up to possibly forming an astronomy club at The Thames. Mesdames Macdonald, Mackay and Lush may have been at a Benevolent Society meeting, but were also due to return at any moment. From first glance, you don't know there is a festival happening in the town - maybe next year organisers could hang some banners or similar across the main street. 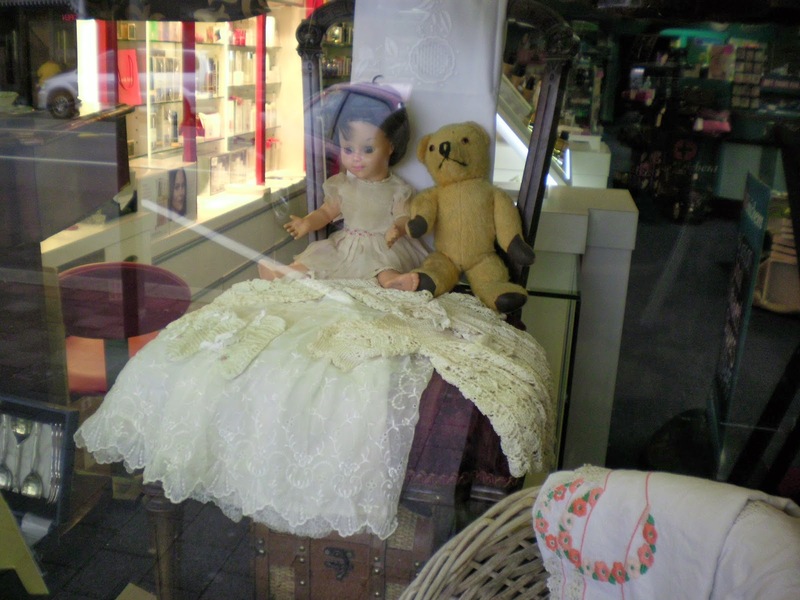 On closer inspection an assortment of shops have got into the spirit of things and transformed their windows, as part of the window display competition. One of mention is at Unichem Heather Moore Pharmacy in Pollen Street, Thames. So many items to stop and explore. 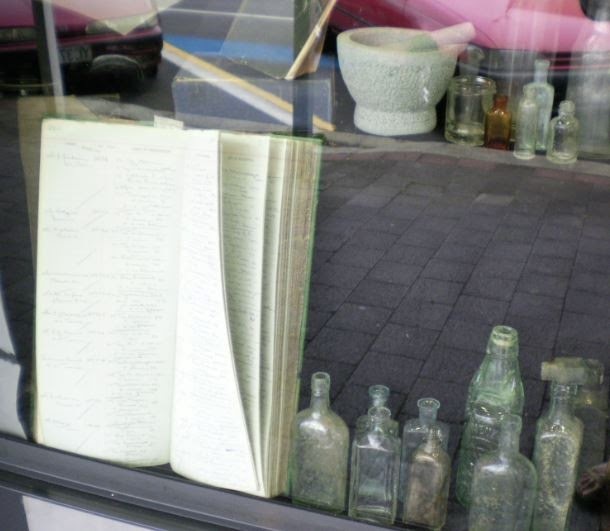 Old dispensing books, bottles and general merchandise items. One event that is happening as part of the Thames Heritage Festival is the launch of a new book on Friday 21st March 2014. This is the story about a girl who lived in Thames and was brought up by people that were two generations older, they have never been married or had children. These people were the "Lambs". 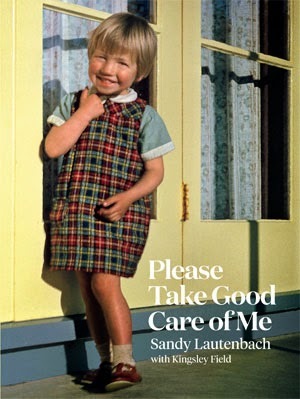 It traces her life through to adulthood with all the trials and tribulations that go along with her. 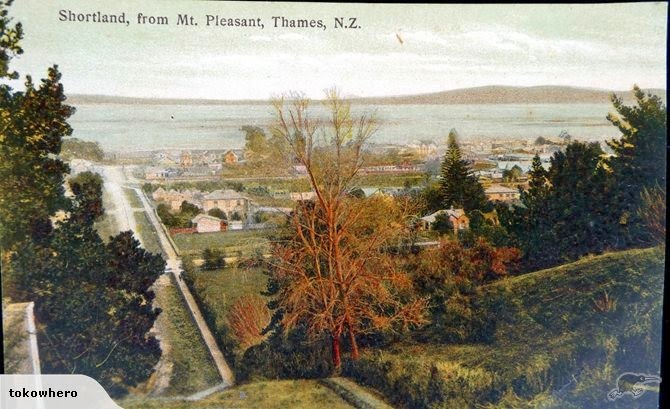 The story starts in 1870 when both sets of Great Grandparents on her mother's side and father's side came to N.Z. for a new life. It also incorporates Waihi as her mother came from there, and her Grandfather was the founder of Brown and Brown who made Suzy ironing boards, bread slices etc. The book will be filled with not only photos of the Lamb family but also of the old township of Thames. After Friday it will be available at Carsons Bookshop in Thames and from The Best Little Bookstore. Well Thamesites of old learnt to cope with the weather and flooding; as a result of today's conditions the quiet scene below is because the opening ceremony is being held in the nearby St James Church Hall. Very soon the building will be officially opened! The sun is trying to break through as I write, so fitting to finish with this beautiful view from Mount Pleasant, looking down at the lower section of Grey Street - Upper Grey Street is now known as Mount Pleasant Road. It is a mystery how many of the old streets of Thames just suddenly seem to change their name and why this should be? Or more importantly why it should be allowed. 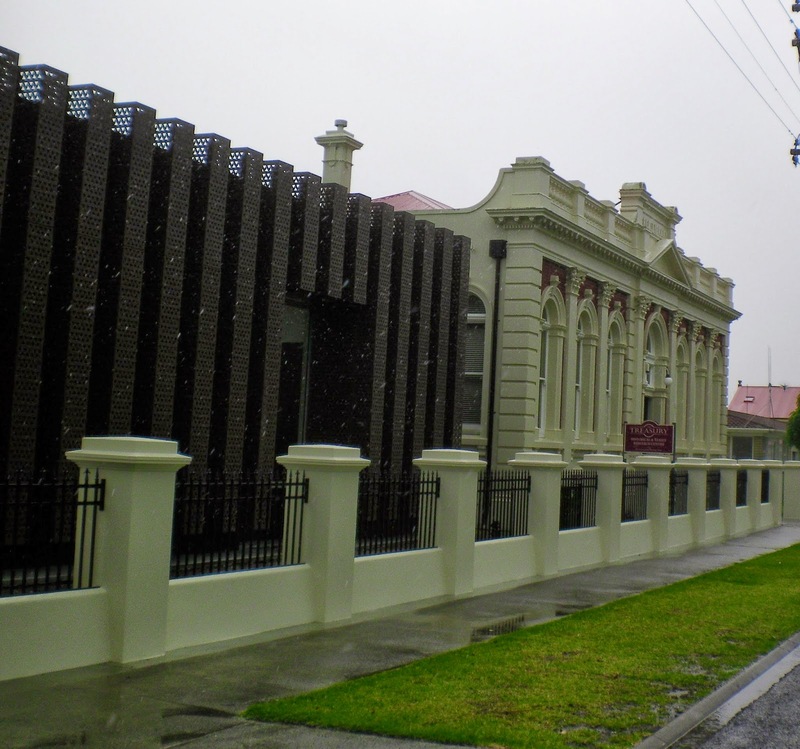 There may be a storm on the horizon for Saturday 15th March 2014, but it will also mark the official opening of the Treasury Archive Building. The street today is full of cars - as last minute arrangements are attended to. 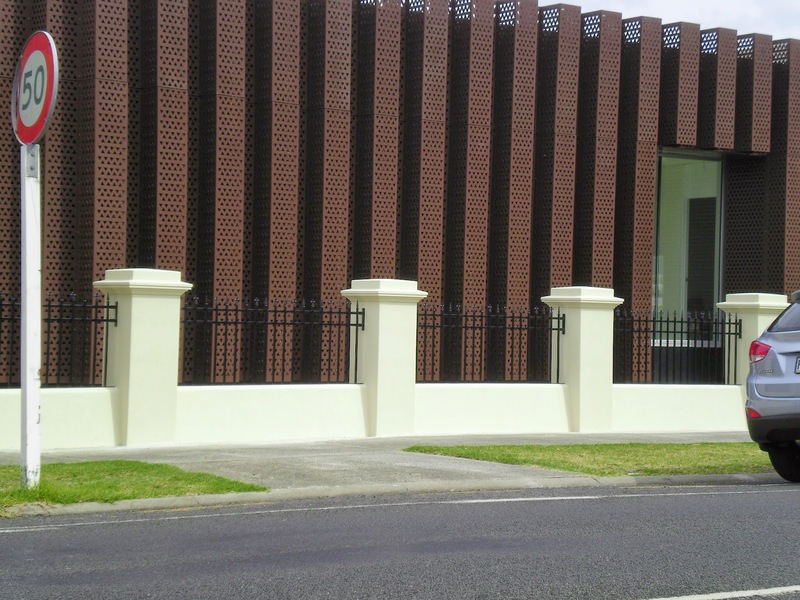 The fence is complete and restores the image of years past, when the wrought iron fence fronted the Thames Carnegie Library. The official opening is at 2pm - if you are in town, drop in for a visit, it will be the only time that the general public will get to see inside the archive building. Come to Thames Cinema and enjoy a 1960's classic New Zealand movie "Runaway" starring Colin Broadley in the leading role, Kiri Te Kanawa, Diedre McCarron, Barry Crump, Alma Woods & Ray Columbus and Tanya Binning. The title song features the well-known Maori Show Band, The Quin Tikis. The full programme will be on the Trust Website www.thetreasury.org.nz. Three screenings at 11.00am, 4.00pm and 7.30pm. Available ONLY AT CINEMA before screening times. The photo below is looking south from the Sealey and Pollen Street intersect. The Imperial Hotel on the left. Remember all the open gutters? The cars are taking no risk of accidentally parking too close to the drain! 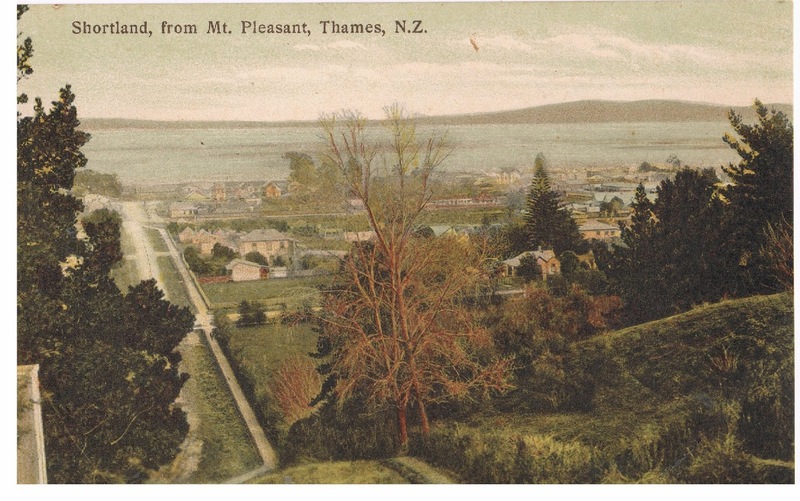 Thames, like any New Zealand town, always looked forward to a special visit by a dignitary - a chance to showcase the town they were so proud of. The town would be busy preparing banners and flags to adorn local buildings. The hospital in 1921 suitably dressed the entrance to welcome the Governor General to the Thames Hospital on Baillie Street. 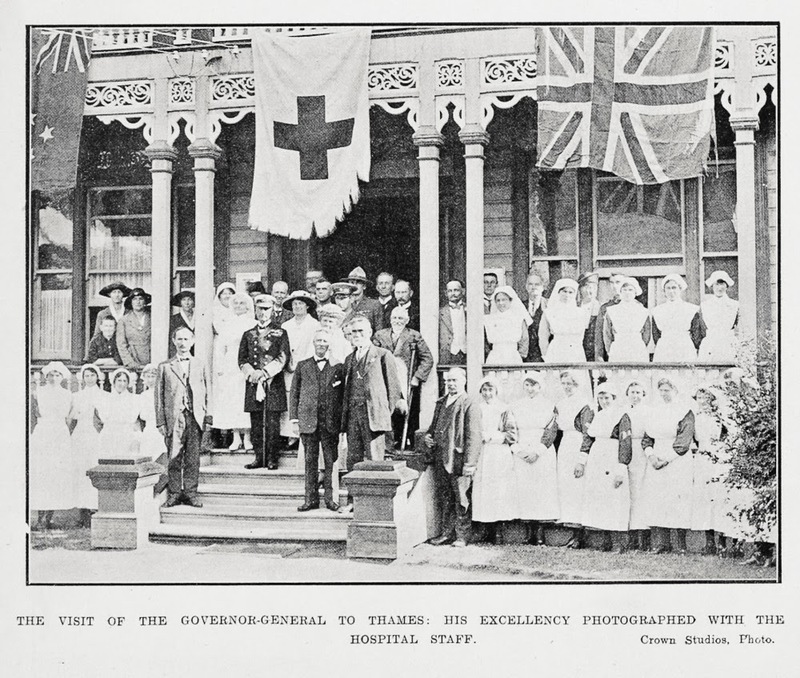 Photo below: THE VISIT OF THE GOVERNOR-GENERAL TO THAMES: HIS EXCELLENCY PHOTOGRAPHED WITH THE HOSPITAL STAFF. The Governor General was Admiral Jellicoe, a man admired in the town and whom a street was named after (Jellicoe Crescent). He arrived in Thames on the 22nd April 1921 and was given a grand welcome, and would have been impressed with the grant display of electric lights that lit the town! One thing on his busy agenda was the unveiling of the Thames South School Soldiers Memorial. In 1921 the last evidence of the great brewery of Thames disappeared, that of the chimney for the Phoenix Brewery. The Ehrenfried brothers had come to the town and established a thriving business locally, nationally and internationally. 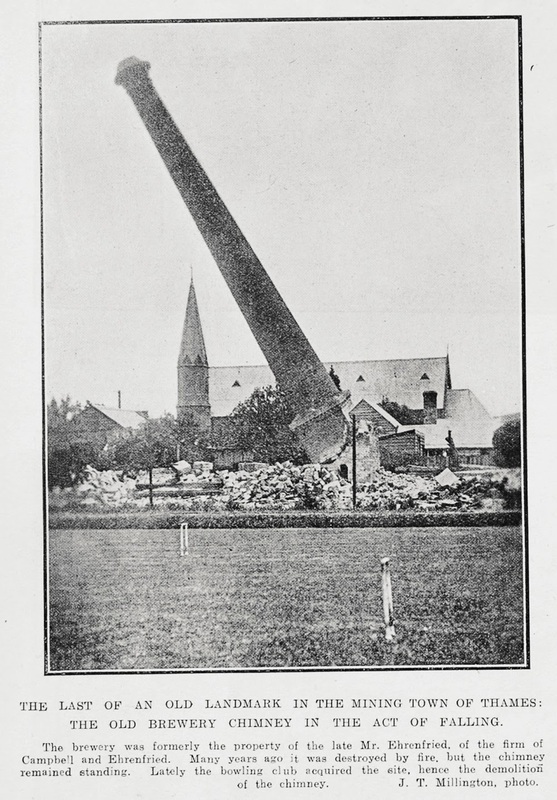 The photo below reads: THE LAST OF AN OLD LANDMARK IN THE MINING TOWN OF THAMES: THE OLD BREWERY CHIMNEY IN THE ACT OF FALLING. The brewery was formally the property of the late Mr Ehrenfried, of the firm Campbell and Ehrenfried. Many years ago it was destroyed by fire, but the chimney remained standing. Lately the bowling club acquired the site, hence the demolition of the chimney. Situated on Mackay street, the photo above looks north towards the St George's George at the corner of Mackay and Mary Streets. Below is the site as it is today - part of TCDC land and the Thames Bowling Club.